What a bold statement we are actually singing. I think if we realized what was actually coming out of our mouths, we might hum that part or lip sync. What kind of situations leads us to a state of complete and utter trust in God? One that might cause us to depend on him solely for provision when it comes to our finances. What kind of time in our lives allows us to feel like we are walking on the waters in the presence of our savior? One where the waves threaten to overwhelm and overtake us with life’s demands or an ever-increasing busy schedule. In what situation might you ever be taken deeper than your feet would have ever originally dared to wander? Perhaps you are in a new town or a new job that has taken you out of your comfort zone completely. So how does the last part come true?... 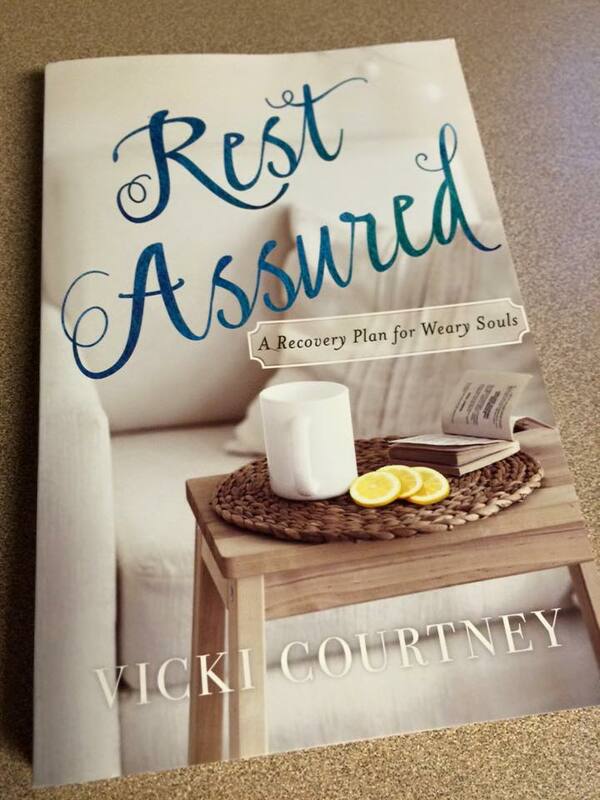 “My faith will be made stronger in the presence of my savior?” The answer is REST. 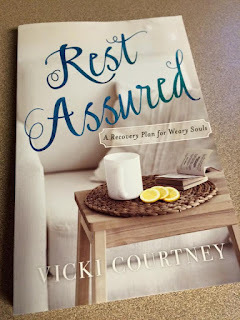 In Vicki Courtney’s new book, Rest Assured: A Recovery Plan for Weary Souls, she writes a beautifully honest and real take on how we can rest in the middle of the storms in our lives. She explains that sometimes the storms are brought on by ourselves and our need to never disappoint anyone and our constant people pleasing. This leads us to a schedule bursting at the seams and us gasping for air above the never-ending obligations. Other times the storms are out of our control, causing our emotions to spin out of control also. We become frazzled, worn out and stressed. “We’ve all experienced our fair share of wit’s end moments. Moments turn to days, and days turn to months. Before long, being at wit’s end becomes our standard default setting. With practical advice coupled with raw and truthful accounts in her own personal life, she encourages the reader to find the areas in their lives that are spinning out of control in the first part of the book. In the second part, is when the recovery plan comes in. She asks the reader to devote one week per chapter to truly let it soak into their hearts and lives and each piece of advice to begin making a difference in the life of the reader. The goal here is learning to enter God’s rest through the difficult times because that is when you are able to fully hear the voice of God speaking to you and make clearer and wiser decisions for your future. I am also very excited to give you an opportunity to enjoy this incredible book and learn to begin to truly enter God’s rest, which is so appropriate, especially this time of the year.